As Game of Thrones continues to wow TV audiences across the world, and Peter Jackson continues to trouble the box office with his Tolkien adaptations, it's no wonder the slots developers keep turning to the Fantasy genre for inspiration. 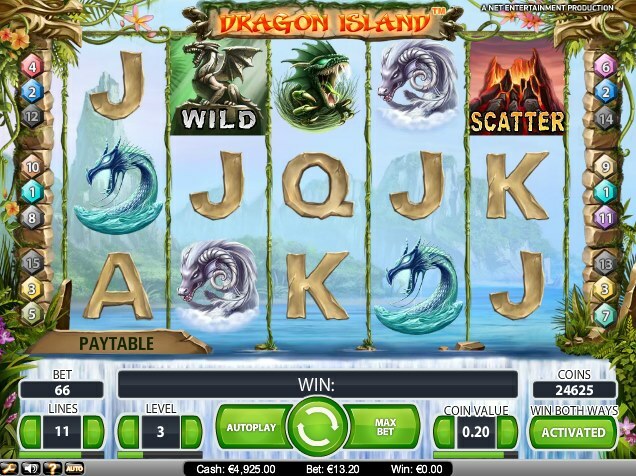 The Dungeons & Dragons slots from IGT - both regular and Crystal Castles variety - are perfect for sword 'n' sorcery slots fans, but online slot developer NetEnt have got in on the act with the fire-breathing frolics of Dragon Island. With bets starting at just $0.01, and winning 'both ways' available (left to right and right to left) this is a slot for all wallets, but there are still plenty of opportunities to win big. A 5-reel, 15-payline online slot, the game plunges you on a mystical island populated by marauding dragons, each one representing a different element, and a gang of evil shape-shifting 10-through-Ace symbols, here cunningly disguised as 10-through-Ace symbols. There are two Wilds in the game, both represented by dragons. The first regular Wild is the Green Dragon symbol. He acts as a normal Wild and substitutes for all symbols other than the Golden Wild and Bonus Scatter. The Golden Dragon Wild, meanwhile, also doesn't substitute the Scatter, but it does trigger a random multiplier from 2x to 8x. The Scattered Volcano triggers free spins, and is the big symbol to aim for. Get three of them on the reels - easier said than done - and you'll get free spins, escalating from 10 freebies for three Scatters, up to 50 spins for getting five Scatters. If that sounds pretty good, wait till you see what happens during the free spins. Each spin features a special Expanding Wild, randomly assigned, and they can be re-triggered. Getting to the free spins can be an effort, but once you get there it can be pretty lucrative. While the atmosphere is decent enough for a fantasy-themed slot, you'll probably find a bit more depth in one of the D&D slots I mentioned at the top of the review. 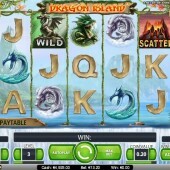 The free spins round here, however, is the real draw of Dragon Island, and despite being tricky to trigger, is worth persevering with.